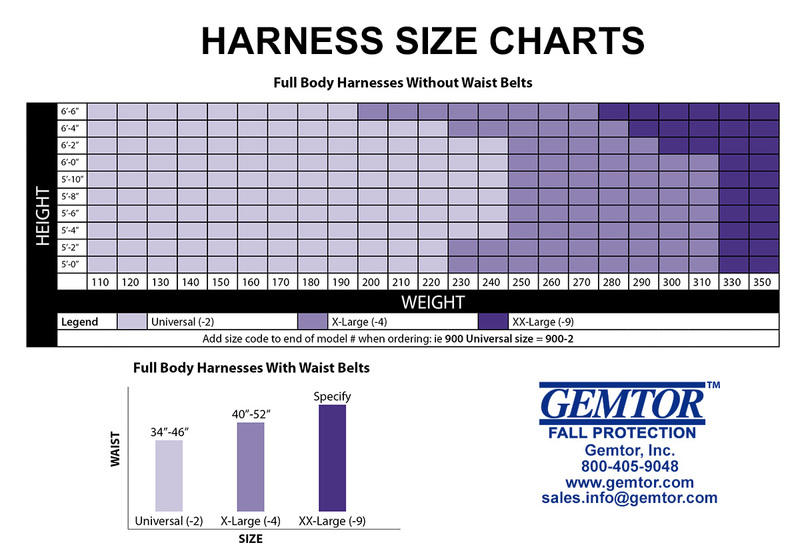 GEMTOR'S ELITE SERIES of Full-body harnesses is designed for Maximum Comfort and usability. 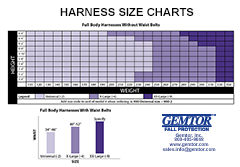 Most “Elite” harnesses include Gemtor’s Airflo™ breathable padding that allows air to flow completely through the pad. Foam has been replaced by a specially designed “3-D” material. These pads weigh considerably less than pads on competitive harnesses, allow for unrestricted air flow and always retain their shape and comfort. For tower, climbing & maintenance. Heavy-duty tongue buckle waist belt with hip positioning D-rings and breathable comfort lumbar pad. Seat sling with suspension D-rings. Spring-loaded adjuster on shoulder strap. Fully padded with front D-ring & removable waist/tool belt. Fully padded with removable waist/tool belt. With X-pad and leg pads. • Unique/Flexible dorsal D-ring pad for improved comfort. 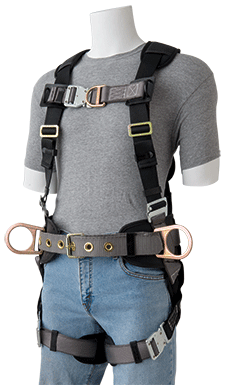 Lightweight, sub-pelvic, polyester full-body harness. Designed for ease of mobility and all day comfort. Features include Quick Connect chest buckle and Quick Connect or Tongue Buckle Leg strap buckles for fast and convenient donning and doffing. Spring loaded shoulder strap adjusters eliminate the need to readjust harness throughout the day. Premium quality, Made in USA. 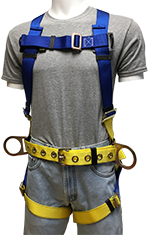 Designed for comfort and ease of use, the harness/vest combo is ideal for busy locations where worker safety and sight recognition are required. 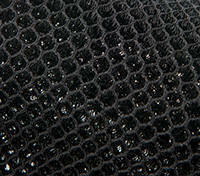 100% Polyester mesh shell and mesh liner. Heavy duty Nylon zipper for Front Closure. 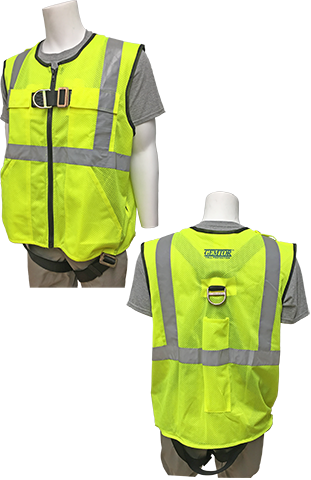 ANSI Type R, Class 2 compliant reflective strips in vertical and horizontal fashion around vest. Nylon edging around sleeve and neck openings. Zipper access at bottom for retention of leg straps when not in use. Also allows access for inspection and cleaning purposes. Dorsal (Back) D-Ring for fall arrest connection. 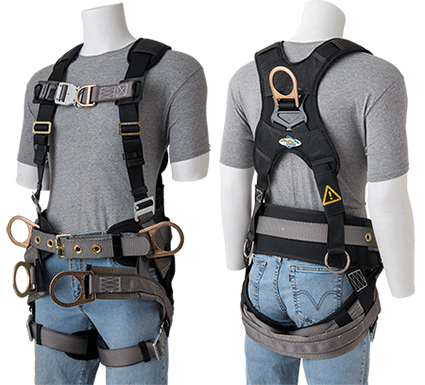 Pass-thru chest and leg strap buckles allow for rapid and easy donning. Meets OSHA, ANSI Z359.11, ANSI A10.32, ANSI/ISEA 107-2015 Type R, Class 2. 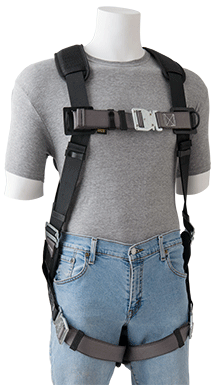 900 Series - Lightweight, sub-pelvic, polyester full-body harness. Designed for ease of mobility and all day comfort. Features include Pass thru leg straps and chest strap. 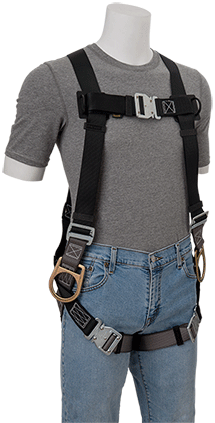 922 Series - Lightweight, sub-pelvic, polyester full-body harness. Ideal when a worker is assigned his own harness. Once adjusted the Pass thru buckles on the chest and leg straps make donning and doffing fast and simple with additional adjustment necessary only when compensating for seasonal clothing changes. 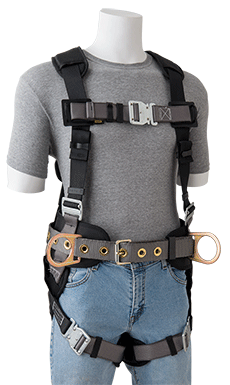 Model # 922SPL - Based on The 922 series, this harness has Pass thru chest and leg straps. Special features include all green webbing that blends easily with outer clothing, an integral soft pack energy absorber, and a pouch for lanyard storage. 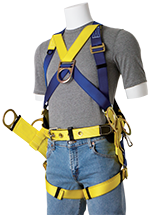 polyester full-body harness with adjustable shoulder straps, tongue buckles on leg straps and waist belt and Pass thru buckle on chest strap. Model # 959 - Same as above except with Pass thru leg straps and waist belt. Model # FPO - Made of 4.5 oz. 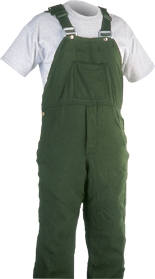 Nomex® IIIA, this overall is lightweight enough to be worn in almost any climate, offers the flame resistance of Nomex®, and features the fall protection of an OSHA compliant polyester full-body harness. 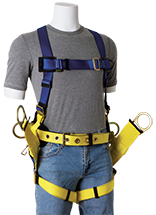 The overall is available in a range of sizes and requires only minimal adjustment since the harness is sized to fit the overall. Pass thru buckles at the shoulder straps makes donning fast and simple. The Model # SPCL energy absorbing lanyard fits in a specially designed pocket at the center of the wearers back. A chest pocket holds the snaphook and web lanyard when not in use. CSA Z259.10 approved model available. 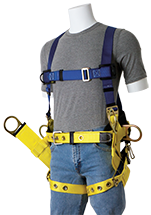 Lightweight, sub-pelvic, polyester full-body harness. Bright yellow webbing with a 3M retro-reflective stripe is Ideal for utility, bridge and other workers who would benefit from the highly visible nature of this harness. Pass thru buckles on the chest and pass thru or tongue buckle leg straps make donning and doffing fast and simple. Hip positioning D-Rings are available (see below). Meets OSHA, ANSI standards. For tower erection & maintenance. Heavy-duty tongue buckle body belt with hip positioning D-rings and foam back pad.